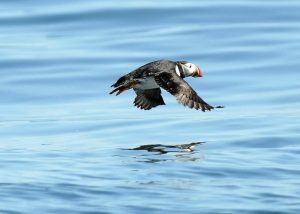 We are proud to be the only tour boat in Maine to offer a Puffin Watch 7 days a week with National Audubon naturalists from Project Puffin. We are fortunate to be located only 5 short miles from Eastern Egg Rock making the trip to the Island quick and easy. The majority of the time is spent observing the Puffins and learning about the ongoing work of National Audubon to preserve this fragile colony. As of 2016, there were a record 150 nesting pairs of Puffins on this small Island. The accomplishments of Project Puffin and Dr. Steve Kress are nothing shy of a miracle. A portion of your ticket fare will go directly to Project Puffin to help preserve and study these fascinating birds. To date, we have contributed more than $100,000.00 to this cause. Our ferry service to Monhegan Island departs from New Harbor, located only 60 miles North of Portland. We offer departures to the Island twice daily at 9 am and 2 pm with returns at 10:15 am and 3:15 pm. Our convenient schedule allows for a nice relaxing day trip or an overnight stay. Monhegan Island is known for its stunning beauty and serenity. Bird watching, hiking, browsing through art galleries and picnicking on the seaside cliffs are some of the most memorable experiences people have on the Island. A Seal Watch is included on the return trip. We proudly support Monhegan Island Sustainable Community Association (MISCA) for their ongoing work to provide affordable housing to Island residents. We also offer daily Seal Watches to Weber’s Dry Ledge and Fall Coastal Cruises.